It’s Colonel By Day here in Ottawa, but almost every day is a holiday when you’re semi-retired. This is the shortest off the rack ever because most of the comics that I wanted to read didn’t have enough rack copies for me to borrow one. I make sure the new comics are available to our customers for purchase so if there aren’t too many copies left after subscriptions are pulled I don’t take them home to read for myself. It actually worked out great for me because my oldest friend is here from Calgary cleaning out his old family home after it has been sold. We have known each other for almost 60 years. I cajoled him into going fishing with me on Saturday and we had fun on the lake enjoying the quiet and catching up with our lives. Then I took another friend out to the lake with his two young sons on Sunday. My mission was to have my three guests catch at least one fish and I accomplished that. I was the only one that got shut out but that’s because I didn’t fish much, taking care of one of the boys myself. It got a little hairy with four people in the boat and lures flying everywhere but we got lucky and no one was injured. We are finally getting a new fence this week. Our old one blew down back in April but there was so much damage during that wind storm that everyone was busy and we couldn’t get anyone to build our fence until now. Our trusty handyman Keith will start today and guess what? It’s going to rain soon. I knew that would happen. We had almost drought conditions through June and July so ideal for working outdoors and as soon as we can start on our fence Mother Nature decides to get wet. Poopypants. So, for what it’s worth, here are the two comic books that I read last week. Adventures of the Super Sons #1– Peter J. Tomasi (writer) Carlo Barberi (pencils) Art Thibert (inks) Protobunker (colours) Rob Leigh (letters). Hey, I thought Super Sons got cancelled? 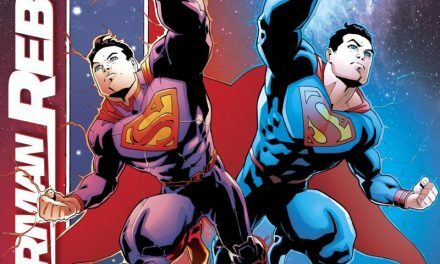 I’m happy to see the boys back on the racks in this adventure before Jon went into space with his mom (see recent issues of Action Comics and Superman). The old Super Sons series left their headquarters heavily damaged after their fight with Kid Amazo. This new 12-issue maxi has them facing The Gang, a team of six humanoid alien kids who have modelled themselves after super villains of Earth. We meet Shaggy Boy first (I don’t know who he’s a fan of), then Ice Princess (Captain Cold), Kid Deadshot, Brainiac 6, Joker Jr. and their leader Rex Luthor. Okay, not super original I’ll give you that, but they have Gold Kryptonite. Find out how that affects Superboy and get ready for some summer fun. Batman #52 – Tom King (writer) Lee Weeks (art) Elizabeth Breitweiser (colours) Clayton Cowles (letters). Cold Days part 2. It’s Batman vs. Bruce Wayne in a most unexpected way. We have already been witness to Hush masquerading as Bruce but it’s not that. Here we have Bruce the jury member trying to convince his fellow jurors that there might be reasonable doubt in a slam dunk murder conviction for Mr. Freeze, who Batman apprehended. I love this type of comic book. The supporting cast gets a chance to shine as well during arguments for and against reaching a guilty verdict. I hope that fans will see what a good artists Lee Weeks is. He’s not flashy like an Art Adams or an Adam Hughes, but man can he draw. I can’t wait to see how Bruce proves that Batman screwed up.